A Covent Garden branch of the Japanese yakitori restaurant. 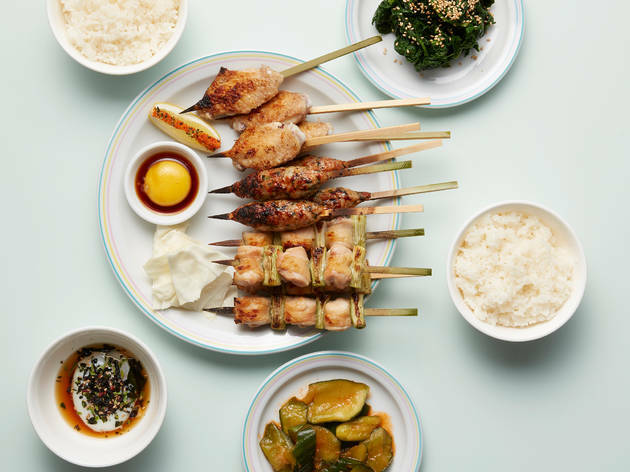 Jidori’s second location, in a four-storey terrace in Covent Garden, is a lot like the Dalston original: funky, functional and really great with skewered chicken (yakitori, to be precise). Tsukune (off the dedicated yakitori menu) was killer: a deliciously salty minced chicken meatball speared on a stick, with a dip of dark soy that also had a bright yellow egg yolk plopped on top (stir them together before dunking). Negima yakitori was also excellent: soft, smoky pieces of charcoal grilled chicken and aromatic bits of spring onion between each bite. A katsu curry scotch egg made for the perfect starter (crispy but soft and jammy), and dessert was unexpectedly great. Heard of purin gyunyu? It’s a delicate Japanese milk pudding that’s like a panna cotta lite. Here, it was topped with an impossibly delicate serve of elderflower granita and sneaky, tart gooseberries hiding between the layers. A truly delicious combination of flavour and texture. There were two let-downs: a slimy aubergine rice bowl (available at lunch) and a skewer of mushrooms. So Jidori probably isn’t ideal if you don’t eat meat, but for chicken, and drinking, it’s perfect. There’s a stellar drinks list and a karaoke room decked out with pink streamers in the basement. Pair your skewers with a Cher banger and head on down for a night to remember. Dinner for two with drinks and service: £70. Simple, pretty, reassuringly Japanese flavours and precision but refreshingly contemporary and unique! Opened in February this year, this is the second site for Japanese restaurant Jidori. 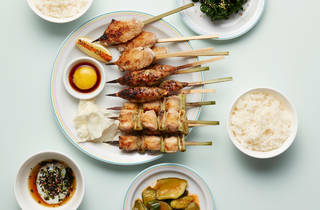 This cute and modern restaurant serves authentic yakitori along with friendly staff. There is a good choice of skewers for all and enough options on the menu for vegetarians. Their katsu scotch egg was also one of our favourites (if you like a runny onsen egg, this is a must have). I would happily come here again as good service, good food and reasonable prices are just what I love!